Wage theft in Iowa amounts to stealing a year of earnings from an estimated 39,392 minimum wage workers, totaling about $594 million, according to statistics gleaned from a study by the Iowa Policy Project. That estimate, drawn from the project’s August 2012 report, is one of the reasons the Iowa Legislature has considered a bill to help stop businesses that cheat workers from doing so. The bill stalled this year and the Legislature has adjourned. The Iowa Policy Project described wage theft as “The Invisible Epidemic” that goes largely unnoticed and most often targets the most vulnerable low-wage factory workers, immigrants, the disabled and poor. In Iowa, hundreds of wage claims a year are handled in the Division of Labor by a single, full-time wage investigator and an executive officer who splits her time with another department. 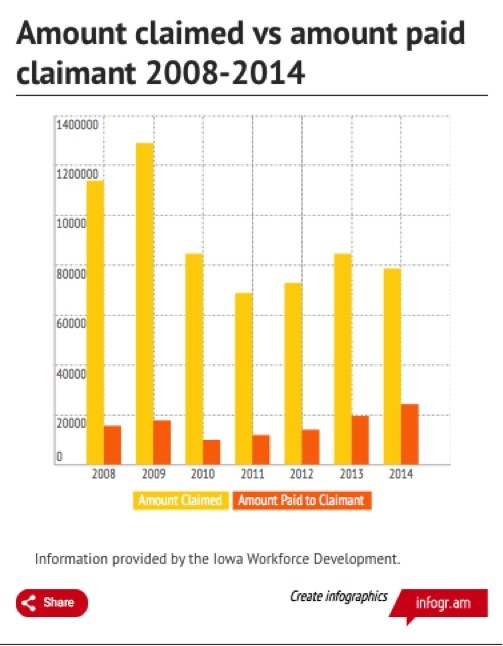 The division was responsible for 651 wage claims filed in 2014 that resulted in $242,252.25 paid to claimants, according to the Iowa Workforce Development, which houses the Division of Labor. The Iowa Policy Project report’s authors and worker advocates say wage theft usually strikes those least likely to challenge the losses, which means vast numbers of workers never report their losses. The report said contributing factors such as fear of retaliation and ignorance of the law make it unlikely that most cases will ever show up on the dockets of state or federal agencies. Wage theft includes non-payment and underpayment of wages, paying tipped employees less than minimum wage and other tipped-job violations, deduction violations or misclassifying of employees as independent contractors to avoid wage laws and any other practice that denies workers their agreed-upon wage. The Iowa Legislature has wrestled with the problem for years, and it is not likely to go away. A bill to reform current law on behalf of wage theft victims passed the state Senate last year and in 2011, but failed in the House, because of Republican and business opposition. This year, it again passed the Senate but stalled in a House committee before the Legislature adjourned the first week of June. Mark Hanawalt, board chairman of the Iowa Association of Business and Industry Foundation, said that while his members are “ethically opposed to any form of wage theft,” he nevertheless questioned the severity of the issue and said this year’s legislative bill would have overburdened legitimate businesses with regulations because of a few bad players. “They are taking advantage of low wage workers with the least political power to fight back,” Bolkcom said. Introduced by state Senators Tony Bisignano, D-Des Moines, and William Dotzler, D-Waterloo, the bill would require employers to provide pay statements on paydays, to keep a record of employment terms, notify employees in writing of any changes and obtain their permission and provide routine wage statements on paydays. The bill would remove the current provision in the law that requires victims of wage theft to demonstrate that the violation was intentional, to recover unpaid wages or expenses plus liquidated damages, court costs, and attorney fees. The bill also forbids an employer from retaliating against employees filing wage theft claims or who testify on behalf of a claimant. 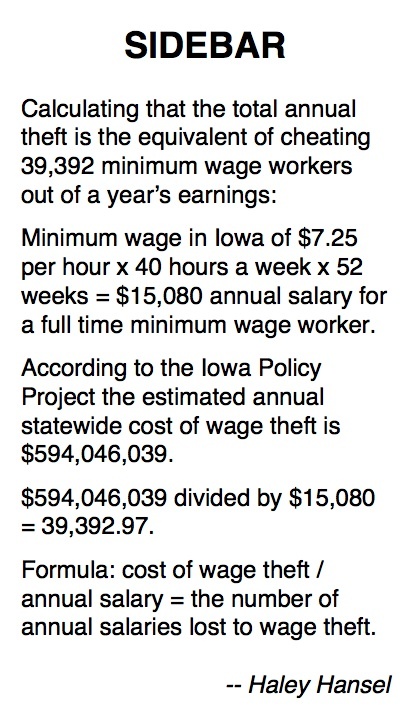 The Iowa Policy Project based its estimate of $594 million in wage theft by using national estimates that just over two-thirds of low-wage workers in any given week lose a minimum of about $42.91 a week in wage thefts and an Economic Policy Institute analysis that about one-fourth – 266,221 – of Iowa’s workers earning below-poverty wages and are wage theft victims. That worked out to $2,231.32 in annual thefts per worker for a total of $594 million. That would be enough to pay 38,392 workers $15,080 over one year at the minimum wage of $7.25 per hour. Colin Gordon, senior researcher for Iowa Policy Project and history professor at the University of Iowa, blamed the wage theft problem partly on the decline in union membership and the large number of workers in “precarious employment” – people working short term, day laborers and temp agencies. Those workers form part of a “bigger picture” created by businesses relying on independent labor contractors instead of hiring their own employees, said Misty Rebik, executive director of the Center for Worker Justice of Eastern Iowa and a contributor to the Iowa Policy Project’s wage theft report. Rebik accused businesses of “strategically” using temp agencies and contractors to create separation between themselves and their employees. 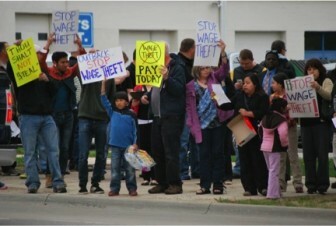 Protesters upset about unpaid wages gathered in front of the Outback Steakhouse in Cedar Rapids in May 2014. “This way the big company can say ‘not our employee, not our problem,’“she said. The Center for Worker Justice, which is affiliated with numerous labor unions and labor organizations, works with eastern Iowa communities to address injustices in areas such as the workplace conditions, civil rights, access to education and the need for affordable housing. Two years ago, Kossiwa Agbenowassi, an immigrant from West Africa and mother of five, asked the center and Rebik to help her regain earned wages that she claimed were withheld from her by a cleaning contractor hired by Outback Steakhouse. She explained her case last November in a press conference in Iowa City. She worked seven days a week at the since-closed Coralville restaurant spending the majority of her time working alone cleaning the dining room and kitchen. The contractor paid a flat rate which, when divided by the number of hours Agbenowassi worked, ended up being $6.12 an hour, nearly $1.38 below minimum wage. Agbenowassi quit on July 18, 2013, and alleged in a legal complaint that she didn’t get paid for her final 49 days of employment for 15 months. During that time, she joined protests at Outbacks throughout the state. Outback Steakhouse spokeswoman Elizabeth Watts said a separate contractor employed Agbenowassi, and that contractor could provide more information. But Agbenowassi, in coordination with the Center for Worker Justice, said she searched for the contracting firm but never found it. Rebik said the contractor was not registered to work in any of the states where it had employees and didn’t have a functioning phone or address. Agbenowassi recovered her wages after hours of work by the Center for Worker Justice and an investigation by the U.S. Department of Labor that recognized Outback as a joint employer. Jennifer Sherer, director of the University of Iowa Labor Center and co-author of the Iowa Policy Project’s wage theft report, said state enforcement of wage theft laws is limited. That is why many groups like the center are forming to help workers, she said. She also said unions can help in workplaces where they have members because a process is in place to address wage issues. 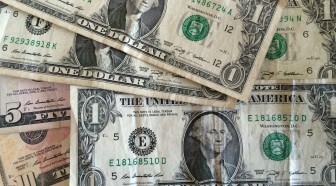 Navigating the process for recovering stolen wages without assistance is difficult. 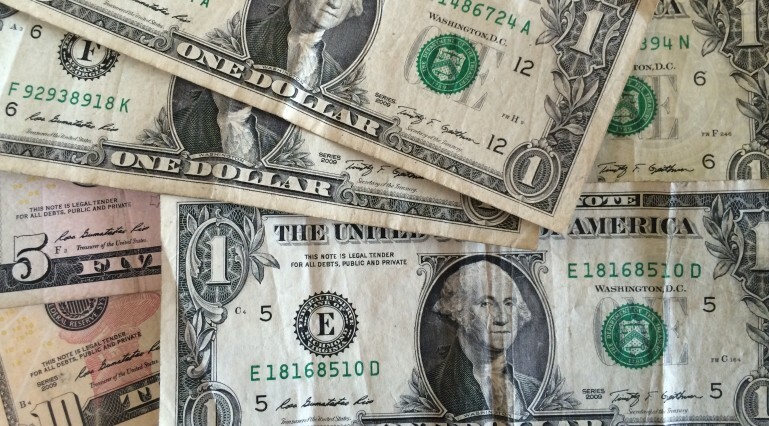 “A huge part of the process that is a huge barrier for people is just knowing how to navigate it and gather evidence for themselves,” Pfab, the state minimum wage and wage payment official, said. Rebik said employees with temporary employment agencies and labor-oriented jobs often don’t complain about wage theft because they compete for jobs. “Businesses have created this desperate, vulnerable contingent. The employees know they are being treated unfairly, but they are too afraid to talk about it,” Rebik said. Industries across Iowa’s estimated 1.5-million-person workforce employ this tactic when managing employees. Gordon, with the Iowa Policy Project, said people don’t understand how often it happens. “This is not an occasional bad apple employer. In some industries it is almost par for the business model, and it is built into the basic assumption of laborers,” he said. This IowaWatch story was published by The Hawk Eye (Burlington, IA), The Gazette (Cedar Rapids, IA), The Courier (Waterloo-Cedar Falls, IA), Council Bluffs Nonpareil and Sioux City Journal under IowaWatch’s mission of sharing stories with media partners. To learn how IowaWatch’s nonprofit journalism is funded and how you can support it, go to this link. ABOUT THE AUTHOR: HALEY HANSEL ORIGINALLY WROTE THIS STORY FOR A UNIVERSITY OF IOWA SCHOOL OF JOURNALISM AND MASS COMMUNICATION CLASS TAUGHT BY IOWAWATCH CO-FOUNDER STEPHEN BERRY. With dishes in hand, Katie Wilson, 27, headed into the Applebee’s kitchen in Coralville as her shift drew to a close. The Ames native said she leaned over the sink and began her nightly routine of washing the plates when she heard something that her managers said she wasn’t supposed to hear.